Our amazing postdoc, Monica, just qualified to be a Neuroscience Scholars Program (NSP) Associate with the Society for Neuroscience! The NSP is a program designed to enhance career development and professional networking opportunities for underrepresented and diverse graduate students and postdoctoral fellows in the field of neuroscience. Way to go, Monica! 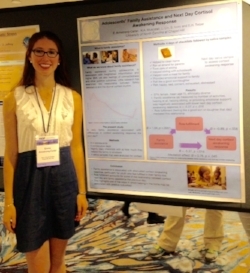 Keely presented results from the lab’s beta blockers study at the Society for Affective Science annual meeting in LA! Great to see our work getting out there. The lab’s four amazing honors students, Carrington, Ellie, Emmie, and Saif, all successfully defended their honors theses! Congrats, all! Here is Ellie and Keely celebrating after Ellie’s wonderful defense. The lab made the trek to Louisivlle, KY for the American Psychosomatic Society annual conference! Jenn, Sam and Gaby presented posters; Monica and Emma gave talks. Everyone learned a lot and did a great job! We also had a fun dinner and hang out session at a brewery. One of our awesome honors students, Carrington, has been admitted to UNC as a dual clinical/social student! Congratulations Carrington! We are so excited for you to join our lab as a grad student! Happy Holidays from the Carolina Social Neuroscience & Health Lab! We are cleaning our impedance data from our Beta Blocker's study! Impedance cardiography is a non-invasive technique for measuring cardiac output. We're training with MSD to run our multiplex assays on a new machine we are trying out at the UNC core lab! Another shipment of dry ice for organizing our blood plasma for the multiplex assays! Dr. Muscatell presented to the "HHIVE" Health Humanities Grand Rounds lecture series today on health disparities and the relationship between stress and health. We are shipping off the blood from our study for analysis in gene expression! The lab manager of the Carolina Social Neuroscience and Health lab, Emma Armstrong-Carter, presented research for the first time to the International Society for Developmental Psychobiology today in Washington DC! The research was a collaboration between Dr. Muscatell's lab and Dr. Eva Telzer's lab. Thank you to everyone who made it possible! Today our lab participated in Brain Academy, an immersive education day program for young students. Emma got to show them the physiological equipment we work with in Howell and explain how we run participants. Maybe we'll see some of these students at UNC one day! Another year gone by! Emma and Keely on Franklin Street celebrating Halloween. This time last year we hadn't even started our big beta-blocker's study, and now we're already moving into data analysis! What a year. Any UNC undergraduates interesting in attending graduate school or just becoming more well-rounded professionally should check out this unique course below that Keely and Monica will be putting on for the Spring 2018 semester! The formal course portion is 1 credit hour while the other 2 credit hours can be completed by volunteering in a research lab. Yet another moment to be proud of our honors students! Honors Student Ellie Wallace received a Tom and Elizabeth Long Research Award to support her thesis on, "Self-Disclosure and Liking Across Groups". Congratulations, Ellie! Honors Student Saif Meyhar received a Sarah Steele Danhoff Undergraduate Research Award to support his thesis on " Neural Mechanisms Underlying Economic Inequality-Induced Increases in Risky Decision-Making." Congratulations, Saif! While most of Chapel Hill heads off for Fall Break, our hardworking team has begun processing blood samples for interleukin-6 in Howell Hall! Today SNH participated in the Research Lab Symposium put on by the Psychology Club and the department! In this event, our post-bac assistant Sam, grad student Gaby, and post-doc Monica spoke with UNC undergraduates about our current work! We did it! We completed data collection for our "PIC" study or Beta Blockers project. Thanks to everyone who put in hard work! That is 1620 tubes of blood collected, 76.8 miles walked to pick up study drugs from the Investigational Drug Services at UNC Neurosciences Hospital, 990 saliva samples collected, and 91 study sessions completed. Great work, team! Honors student Emmie Banks was awarded the David Bray Peele Memorial Research Award to use for her thesis this year. The funds are intended to offset the cost of ELISA kits (immunoassay kit) so she can isolate interleukin-6, a biomarker of inflammation, in blood samples. Emmie plans to study how differing these levels of inflammation affect moral judgment severity. Congratulations! Jenn MacCormack was awarded a Ruth L. Kirschstein National Research Service Award Individual Predoctoral Fellowship (F31) from the National Institute on Aging to study how aging of the peripheral nervous system and brain can impact the interoception of emotions. The purpose of the Kirschstein-NRSA program is to support promising predoctoral students as they develop into productive, independent research scientists. Congrats, Jenn! 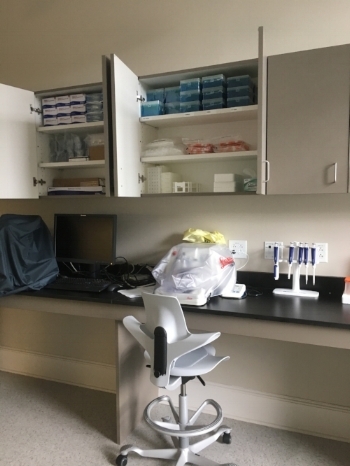 We received new supplies this week-- to run ELISAs for our blood samples! Neatly packed in our wet-lab in Howell Hall, waiting for use. Can't wait to look at these samples! For our research study, "PIC" (Physiology Interacting with Cognition), we work with nurses from the CTRC (Clinical and Translational Research Center). What a hard working, professional yet fun loving group! Here they are pictured below with their solar eclipse glasses last week. We are cleaning EKG and impedance data! We had our first lab meeting today for the semester! What a wonderful crew. After sharing the highlights of our summers, many of us gave updates on our various group research studies and projects. We have several new studies starting up this semester, and some new honor theses as well for the undergraduates! What a wonderful end to a busy Wednesday. Shout out to Graham, Allen and Carrington who are also in the lab but not pictured below! Welcome to Gaby, our new graduate student! Read more about her and her research interests here on the department webpage, and about her NSF Graduate Research Fellowship here. Outside our lab space in Howell Hall, our department's grad students, lab managers, and post-docs join in watching the eclipse! Just next to us, the Morehead Planetarium had an enormous viewing party with over 3,000 attendees. It was an exciting, science-filled day! Emma is back from vacation and looking forward to another semester. Thanks for the kind note, Krista (see below)! Krista did a fantastic job assuming the responsibilities of lab manager this July. Monica started as a new post-doctorate student in our lab! Read her bio on the "people" tab of our website. So excited for our first post-doc student; welcome Monica! Congratulations to our Dr. Keely Muscatell, who received the Psychology Club’s Award for Excellence in Research Mentoring! This award is selected via student nomination to recognize outstanding mentorship for undergraduate students in Psychology. Dr. Muscatell won for her dedication in training undergraduates in rare research experiences through biomedical studies and for advising two senior honors theses in her first year at Carolina. Her mentees describe themselves as “feeling invigorated” about their research simply after meeting with Dr. Muscatell. Inciting a passion for undergraduate research is at the heart of this award and Dr. Muscatell goes above and beyond in her mentorship of undergraduate researchers. Our lab manager, Emma, is officially working full time for The Social Neuroscience and Health Lab for at least one more year! She is excited about the new responsibilities and full time opportunity! Introducing Carolina SNH Lab's new Research Assistants for Summer 2017 - Emilee, Adrian, and Manuela (not pictured)! We are excited to have them on board for the summer. Dr. Muscatell had the lab over for dinner, as a celebration of all the hard work put into the study during the 2016-2017 school year! We are excited to continue working together. Hello from our lab! Undergraduate research assistants are starting exam season, but they are still helping out so much keeping our study going. We couldn't do it without them! 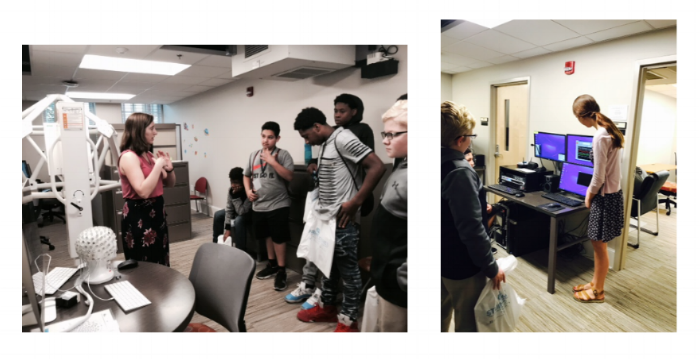 Carolina SNH Lab enjoyed showing The Morehead After School Exploration Program all about our lab. 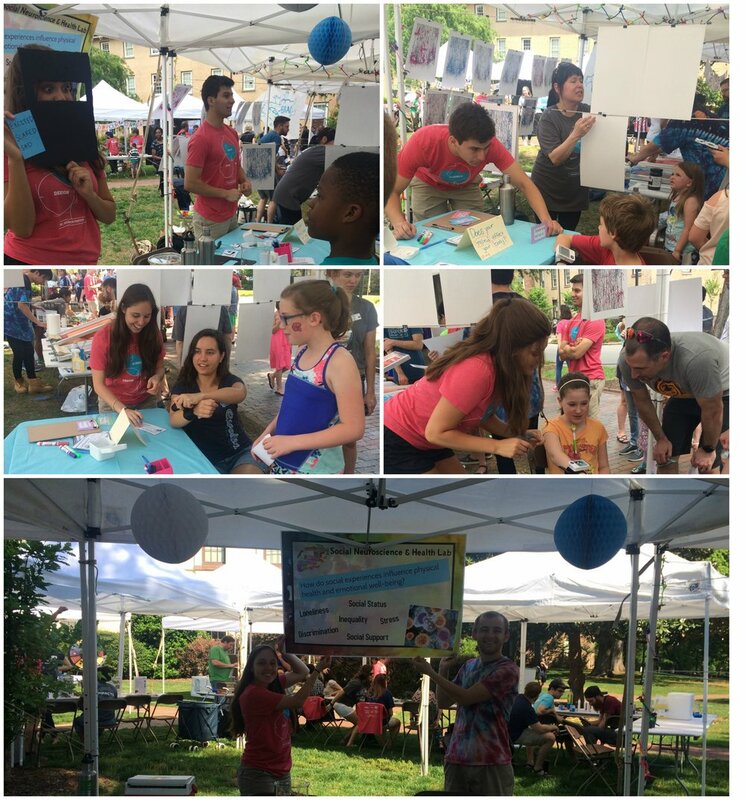 Carolina SNH Lab had a great time at the UNC Science Exposition. We reenacted one of our computer tasks, "Reading The Mind and The Eyes," which showed how we can empathize with others emotions. We also showed them how their body changes through mental stress, by taking their heart rate before and after a mental stressor! We won the national championship!!!!!!! Wish we could have measured done psychophysiology on those basketball players last night. LET'S GO TAR HEELS! Watch our school celebrate here. Carolina SNH Lab went out for a local frozen treat at Chapel Hill's The Yogurt Pump. Dr. Muscatell is presenting at the Carolina Population Center Spring Quarterly meeting tomorrow! It will be at the Health Sciences Library at UNC at 3:30pm. 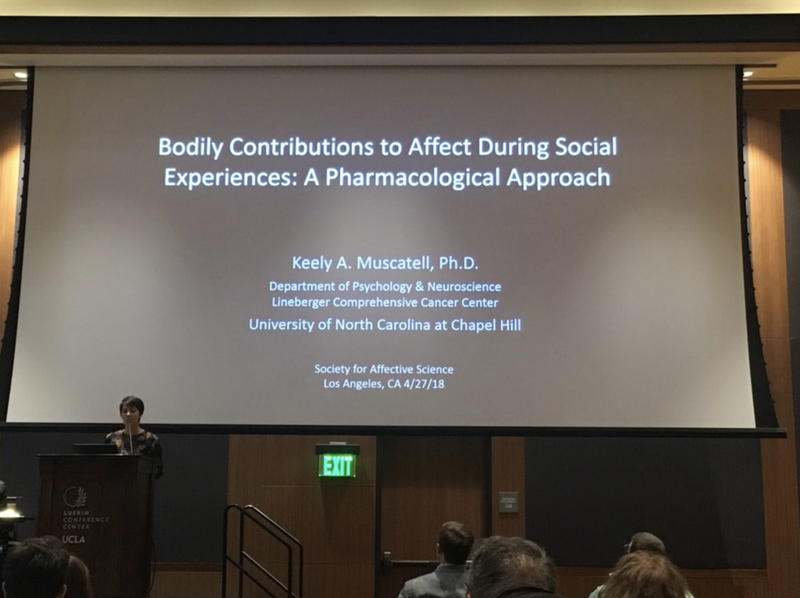 Dr. Keely Muscatell, assistant professor in psychology & neuroscience, is new to UNC and recently joined the CPC Program. Her research offers a novel way to understand the development of health disparities and the links between stress and health by focusing on the neural and physiological mechanisms linking social experiences and health outcomes. Her work explores how being low in socioeconomic status and experiencing racial discrimination affects neural and inflammatory processes. She also examines how stress affects health more generally among breast cancer survivors. Beautiful view from our lab space in Howell Hall! It is almost Spring in NC! Our very own Sam Brosso received a grant from The Department of Psychology Undergraduate Research grant program, supported by the Lindquist undergraduate excellence fund, for our lab! Thank you Sam and congratulations! Spring is coming at Howell Hall! These pink blossoms are blooming just in time for Valentine's Day. What a wonderful view from our Histology lab! It is visiting day in the Psychology Department! These people took our guests out to lunch. Welcome, visitors! Research assistants Emmie and Will give saliva samples before helping out with a study run! Our lab space in Howell Hall looks so beautiful on this winter day! Group picture (Keely took it) from Friday's lab meeting! Go team! We ran our very first research participant! Here is a selfie of some of our fantastic research staff. Our very own research assistant, Samantha Brosso, was recently awarded the Gil Internship at UNC! She will be doing an internship in Behavioral Neuroscience. "I wanted to do the internship because I have developed a particular interest in the biological basis of behavior, and one day I would like to use my specific knowledge of the nervous system to transform the lives of people who suffer from brain trauma, neurological and psychological disorders", says Sam. We are learning how to program tasks into Psychopy! It's difficult but we are working hard. Thanks to Gary and UNC library for their enormous help! SNH Lab Staff gather with the rest of the Human Neuroimaging Group at UNC and spend a warm fall evening together at Tru Deli & Wine Bar! Carolina SNHLab has hired on a new fMRI data analysis assistant (Gary, pictured far left) and four new undergraduate research assistants (Alex, Samantha, Krista, and Arnav)! We are so excited to collaborate with these amazing people! The CSNHL held its first ever lab meeting! Our small but mighty group of scientists discussed the lab’s big project for the year, a study examining how blocking sympathetic nervous system activation with the drug propranolol (a beta-blocker) influences psychological and immunological responses to stress. Dr. Muscatell Joins TEnure-Track faculty at UNC! Dr. Muscatell started work as a tenure-track assistant professor at the University of North Carolina at Chapel Hill this August! Come visit the new lab space in 10A Howell Hall.